I'm so excited! I finally successfully grilled vegetables. Yes, I've grilled kabobs many times but never seasoned up fresh veggies and grilled them. I had a few chayotes (Mexican pears) in the fridge that I just couldn't decide how to prepare. I read a bunch of chayote squash recipes online, looked through a few Latin cook books, no decision. Man I hate when that happens. I knew I had to cook the chayote soon or they would spoil. So, my DH was feeling kind of down yesterday. I thought to myself, since hubby loves grilled food, which according to him is food cooked on a charcoal grill not a gas grill, I made my decision... Dinner would be grilled - chayote and boneless pork chops, with a dill potato salad. I have to tell you, our grill is one of those little Weber table top style grills. I would rather have a gas grill but as I said DH prefers that charcoal taste. This is going to be a real test for me. Now I had some waiting time, so I watched Bizarre Foods with DH while periodically checking the grill and the taters. We really like that Andrew Zimmern, he’s a brave guy. He was in Korea, eating all kinds of seafood, including octopus tentacles that were still moving, yuck! The octopus would have been just fine with me, but the movement is a NO WAY NO GO in my book! When the potatoes were done, which took about twenty minutes, I drained them and put them into a bowl to cool down a bit. Once they were cool enough to handle, I cut them into quarters leaving the wonderful red skins intact, sprinkled them with sea salt, and put them in the fridge to chill. I was listening to Andrew as I started on that wonderful Chayote squash, I had two of them. He was talking about and tasting bean paste. Some pretty stinky stuff I understand. Ok getting back to the Mexican pears…. I used a vegetables peeler to remove the skin. Then I split them in half and removed the core. Now I see why they are called a Mexican Pear, they look and feel very much like a green pear. Even the texture of the meat of the Chayote is like a pear! After coring them I cut them lengthwise about a half an inch thick, put them into a bowl, drizzled EVOO over them, sprinkle with course black pepper then tossed to completely coat. These would sit for about fifteen minutes or so while I finished preparing the grill [UGH]. With the grill hot and ready to go, I laid the prepared Chayote across the grate in a single layer. I let them cook for about ten minutes and turned them. Since the charcoals were pretty evenly spread, almost all of the slices cooked up at the same time. I was so happy with the way the Chayote turned out; grilling the chops was a real easy task. I put them on, covered the grill and cooked for fifteen minutes on each side. The outcome was easy for me and according to my dear hubby, deliciously grilled! Oh I almost forgot to tell you about the potatoes in the fridge! 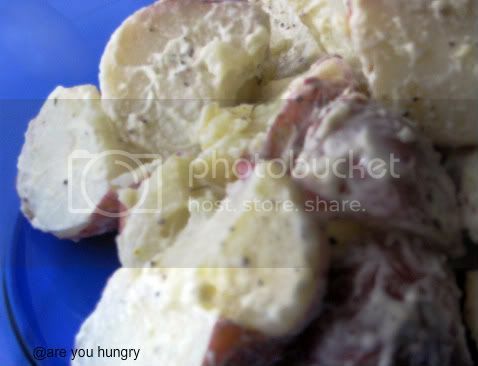 While the chops were grilling, I prepared the potato salad. I added three tablespoons of mayonnaise, half a teaspoon of Adobo my favorite all purpose Latin seasoning, one teaspoon of dill, one teaspoon of red wine vinegar, and a bit of salt and pepper. Gently mixed everything and returned to the fridge until serving time. I have to say, the potato salad was really yummy. It wasn’t really soft and heavy, dressed like common potato salad usually is. It was more like chucks of potatoes, lightly coated with a flavorful dill dressing. The Chayote was scrumptious and I’m excited for that. Hubby, who is a carnivore for the most part, even liked them. Sharing a good food show along with the whole grilling idea did cheer him up. Summing it all up, I would say, my afternoon of grilling was a success. 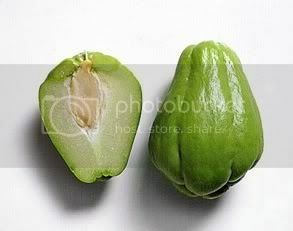 Your chayote looks like what I would call a choko. 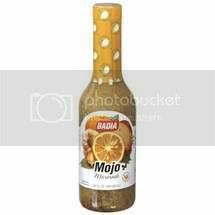 I never thought to marinate it, or to grill on the barbie. Thanks for the good ideas. Jan, Yes I did see that some of the recipes used that name. In reading the Wikipedia info it stated as such. Would be interested to know how you like it grilled. I have a post about chayotes in my draft folder just waiting to be published some day, but they're boiled and then prepared in a very Latin style. I never thought or heard about grilling them and I love the idea. Thanks! Joan, I loved grilled veges. I am always inspired by your posts, and thought it was about time I used some of that inspiration to try something new. 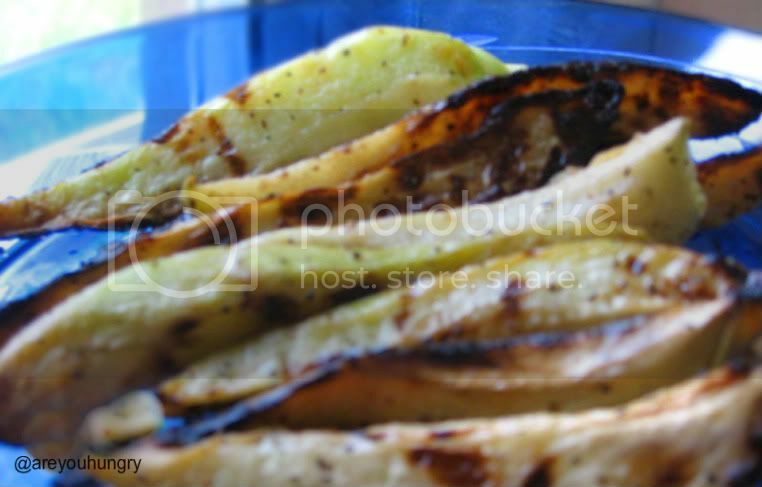 I love grilled veggies! We have a gas grill, though it was a cheap one and has seen better days for sure, but this year I went to Sears and grabbed a Weber because I missed the taste of the charcoal grilled food too. I owned a Weber years ago but sold it after I bought a gas grill. I understand your hubby's thinking because to me there is a difference and if you can get the charcoal just right it actually cooks better - though a gas grill is much less work I have to admit. I haven't gotten around to posting it yet, but I ended up stuffing my chayote with a seafood stuffing. The Hubs ate all the stuffing and left behind the chayote! So typical of him - he is really anti-veggie!! The goofball had no idea that he actually ate the pulp of the chayote because all of the pulp was in the stuffing LOL!! Grilled veggies sound so tasty! We have not rgilled veggies yet this summer, we will have to! We don't grill many veggies, other than packets of potatoes and onions. I bought chayote once but never knew how to cook it! Thank you so much for the tip on grilling the chayotes as I had no idea what to do with them (they were given to us by a neighbor). Will go nicely with my grilled Asian marinated pork tenderloin. Can't wait..